Derbyshire and Northants were frustrated by heavy rain which prevented any play in the NatWest T20 Blast North Group match at Derby on Friday night. Umpires Alex Wharf and Stephen Gale called the game off 25 minutes before the scheduled 7pm start following a brief inspection. The rain arrived at the 3aaa County Ground by late afternoon and with pools of surface water forming around the covers the decision to abandon the game was a formality. It was not the first time the weather has ruined a T20 game between the two teams; last season’s fixture at Chesterfield was called off without a ball bowled and this latest washout is the fourth in Derbyshire v Northants matches. The no result leaves the North Group wide open with Northants moving up to 10 points from eight games while Derbyshire are one point behind having played the same number of matches. Derbyshire Falcons will be hoping for better weather on Sunday when they take on local rivals Leicestershire Foxes at Derby in a game starting at 2.30pm while Steelbacks are next in action on Tuesday evening against Birmingham Bears at Northampton. In a thrilling clash, Durham claimed a six-wicket win with one ball to spare. The Foxes powered to 88 for two, with Luke Ronchi crashing 63 not out from just 21 balls, but Durham were up to the task and replied with 90 for four from 6.5 overs, Paul Coughlin seeing them home with 38 not out from 18 balls. It is Durham’s first T20 win of the season and is good news for the Steelbacks who remain second in the north group table. 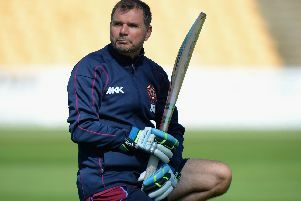 The Steelbacks are second, one point behind leaders Yorkshire Vikings, and point clear of three teams on nine points, who are Lancashire Lightning, Derbyshire Falcons and Birmingham Bears.